This is a recipe for Clam and Scallop Pasta with Tomato in Creamy Wine Sauce. This is a rich and tasty dish that I can eat everyday (although I am more of a meat lover and will likely choose pasta with sausage over most seafoods) . 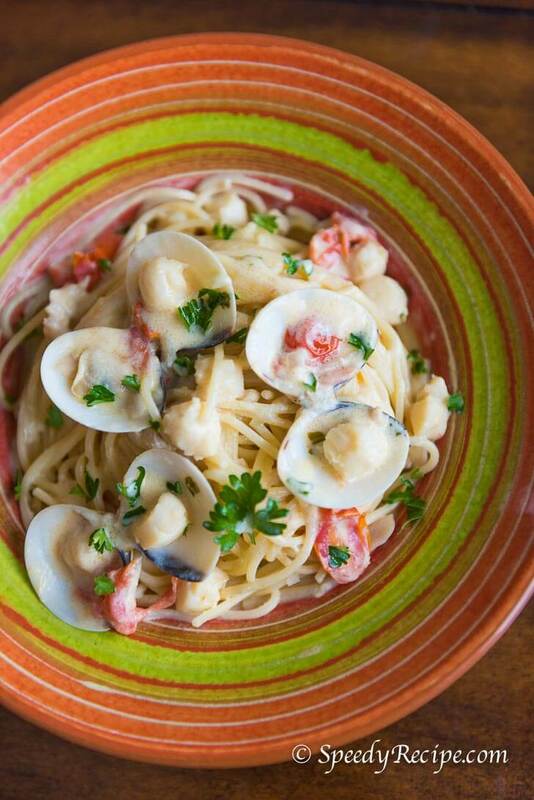 However, this pasta is an exception because has the two seafoods that I enjoy eating: clams and bay scallops. I thought that the creamy wine sauce complimented the rest of the ingredients. It was yummy even though there is no red meat in it. I used a frozen pack of cooked clams. It had to be thawed before cooking. The scallops were fresh from my local supermarket. I also got a bottle of clam juice for the sauce. It helps a lot in making the sauce tasty. If you want the sauce to be tastier, I suggest that you use a can of chopped clams in addition to the ingredients provided below. The grape tomatoes are a must for this dish because it provides that nice sweet tomato taste which blends well with the rest of the ingredients. You may also like to squeeze a quarter of lemon to give it a bit of tart taste (if desired), although I did not do that for this particular recipe. What I did was to squeeze some lemon on the dish when I was about to eat the pasta. Give this Clam and Scallop Pasta with Tomato in Creamy Wine Sauce a try today. Bon appetit! Stir-in the scallops and tomato and cook for 2 minutes. Add the clams. Continue to cook for 4 minutes. Remove the clam, tomato, and scallops from the pan and put in a clean bowl. Leaving the juices in the pan. Pour the wine on the pan. Reduce to half. Add the whipping cream, Parmesan cheese, and clam juice. Stir and let boil. Cook in medium heat while stirring for 3 minutes. Put the scallops, clams, and tomatoes back in the pan. Stir. Arrange the prepared spaghetti in a bowl. Pour the sauce over. Toss. Top with chopped parsley. Serve and enjoy! I tried making it with linguine. It was good. I added half a teaspoon of red pepper flakes to make it a bit spicy. A few more Parmesan on top to finish it off. Will try this recipe. Look much tasty and healthy.